EVERYONE WELCOME - 13th July, 6-7pm. Hebden Bridge Town Hall. This event will also be live-streamed on the Authentic Living Facebook page for those around the world who wish to join us. The 13th of July looks set to be a day of strong emotions, political debate, reaction, ideals, ideas, as well as apathy, denial, opinion, sensationalism and just more of the same old stuff that separates us from each other. Like every other day, it is also a chance and a choice to be a day of awareness, compassion, love, and change for the better. Genuine change can only come about when we meet what is with real presence and awareness. Reactivity, while it might feel powerful and entitled, leads us away from the ability to see and respond from consciousness and heart, and so if we desire lasting peace and progress we must learn to be in the here and the now with clear sight and wholeness - then we become powerful in the truest sense. 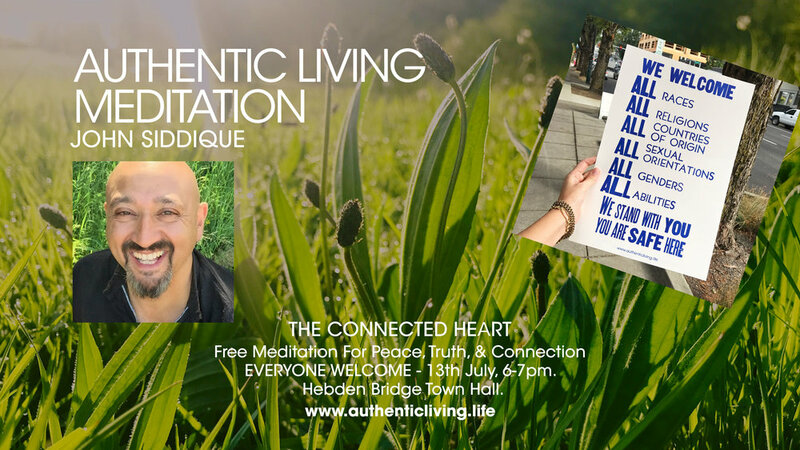 We are giving and sharing this guided meditation event for all who wish to sit in the spirit of truth, peace and openness. All people are welcome. When we gather together in the spirit of truth like this (the old word for it is sangha) we are at our most whole, supported and alive, and we genuinely help by bringing healing, wholeness, transformation and compassion to ourselves and the world.